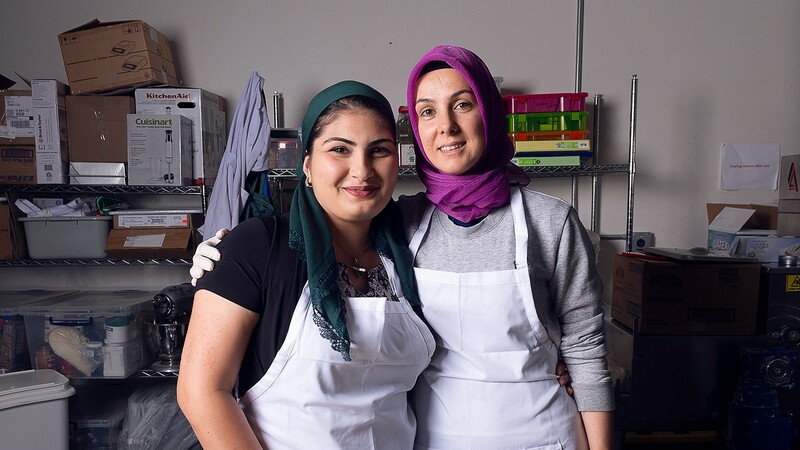 Farida Gvaramadze and Hatice Yildiz of Simurgh Bakery. When Hatice Yildiz started her bakery, the man sent from Turkey to help install a dough sheeter couldn't believe she would be the one operating it. Making baklava, the syrupy pastry with layers of filo dough, is typically a man's job in Turkey. In professional factories, the man was accustomed to all-male crews handling heavy dough, so it took a while before he addressed Yildiz and not her husband. But Yildiz's first exposure to baklava was through her mother, who made the common Middle Eastern dessert at home in the town of Gallipoli in Turkey. After moving to Berkeley to get her doctorate in Islamic studies, Yildiz was lured by nostalgia into her kitchen to find flavors from home: bright-green pistachios and buttery-flakey dough. While Yildiz's mother — herself a restaurant entrepreneur — encouraged her daughter to pursue academics, Yildiz always had the urge to bake. So she started Simurgh Bakery, which now has a following at the Kensington farmers' market and a number of wholesale clients. "I am trying to show people Turkish culture, hospitality, and our food," said Yildiz. "There are so many misconceptions about Middle Eastern culture. I want people to know that Middle Eastern women can do anything they want." Like Yildiz, other pastry chefs and entrepreneurs in the East Bay are making baked goods, ice cream, and desserts inspired by the flavors of their home countries, but fueled by their unique experiences navigating different cultures. For many of them, the quest for the perfectly chewy mochi muffin center or all-natural corn ice cream has coincided with finding the freedom to express their full selves. From redefining gender norms to starting from scratch in a new place, these chefs fold complex stories of identity into their treats. Andreas Ozzuna, the chef and owner of Wooden Table Baking Co.
"When I moved here, I couldn't find any foods related to my culture so I just started making things myself," said Andreas Ozzuna, the chef and owner of Wooden Table Baking Co. in Oakland. Ozzuna's relationship to food formed alongside her grandmother in Buenos Aires, who made pasta, pizza, and baked goods at their home. Her family made sweets with whatever they could afford; sometimes it was homemade bread with sugar on top. 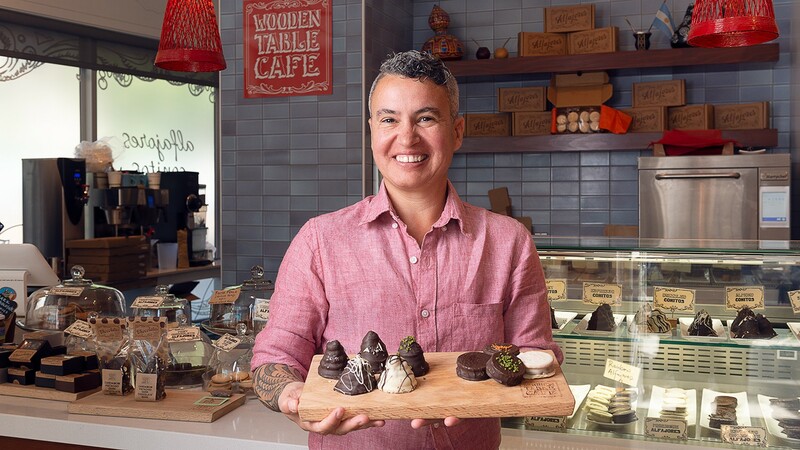 Ozzuna also helped make what's now the signature item at her wholesale bakery and cafe — alfajores, delicate shortbread cookies sandwiched together with dulce de leche, which are commonly found in South America. For a number of chefs, missing the flavors of their childhood street vendors steered them toward their entrepreneurial paths. Meagan Tam, owner of Gadani Cafe in Berkeley, grew up in Hong Kong and moved to Canada with her family in her teens. On trips to Hong Kong, she got her fix of egg waffles, a puffy treat made with an egg-heavy batter flavored with vanilla or chocolate and sold by street vendors. A few years after graduating from UC Berkeley, Tam opened a cafe that serves ice cream and waffle combos dusted with oreo cookie crumbs and rose petals. "I get to combine my passion for my favorite snack and the entrepreneurial side of myself that I always wanted to pursue," she said. To Funn Fisher, the gold standard for coconut ice cream is the kind that came from the bell-ringing tricycle that circled her Bangkok neighborhood as a kid. At her North Berkeley shop, Secret Scoop Thai Gelato, the combinations of flavors and toppings, like pandan sticky rice with roasted coconut and durian black sesame gelato, are also an ode to her days of eating mangos and durian with sticky rice at her local market. Over in West Berkeley, Third Culture Bakery took inspiration for its popular mochi muffin from kue lapis, a steamed rice dessert that co-owner Sam Butarbutar grew up eating in Jakarta. His partner, Wenter Shyu, grew up between Los Angeles and Taiwan, and was raised eating matcha tea desserts from local bakeries. Now, they have their own version of a matcha custard cake and offer a fun matcha drink menu at the bakery. In Fruitvale at Nieves Cinco de Mayo, Luis Abundis is celebrating 11 years of nieve de garrafa, or bucket ice cream, handmade by whipping fresh ingredients over salt and ice in a wood bucket. He learned the technique from his uncle outside Guadalajara, Mexico, but it wasn't until he was tired of working multiple jobs and barely getting by in Oakland that he decided to pick the art back up again. "I said to myself, I know how to do something and I know how to do it well. So, why am I doing other things?" he said. He started with a street cart, and then a truck, and now serves flavors like caramelized milk, corn, and cactus fruit in his Fruitvale Village shop. Many of these chefs walk the delicate balance between honoring traditional flavors, adding a personal touch, and operating in a market that sometimes needs a nudge to try new things. It's not always a piece of cake. Finding the perfect ingredients can be a labor of love on its own. Unable to secure a good coconut sugar supplier, the team at Third Culture Bakery spent their first year wrestling with giant blocks they cut down and granulated themselves. Ylidiz imports pistachios from a specific area of Turkey, the only kind she says that keep their taste and bright green color after baking. After experimenting with several kinds of flours, she settled on a mixture that veers away from traditional recipes. Introducing unfamiliar ingredients and flavors can also be tricky. At Nieves Cinco de Mayo, many customers weren't used to the icier texture of the handmade ice cream or the flavors changing with the seasons, said Abundis. Funn typically shows restraint with sugar, but after several comments altered her gelato recipe to be creamier and sweeter. Yildiz fights perceptions of baklava as too soggy or syrupy, and Ozzuna struggled at first to introduce an uncommon product that's difficult to pronounce for some non-Spanish speakers. At Third Culture, once the name "Hawaiian mochi" was changed to "mochi muffin," it resonated with more people. But for the most part, these chefs are earning major fans by staying rooted in their own creative expressions and values. "The best thing is when someone comes in and says, 'Wow I haven't tasted ice cream like that in years,'" said Abundis, who gets visitors from all over the Bay Area. For Shyu and Butarbutar, naming their business Third Culture was about taking pride in their experience as "third culture kids," which refers to children, often of immigrant families, who grew up in a different culture than their parents. "When I found out about that term it helped me identify myself and come to terms with who I was," said Shyu. As gay men and people of color, they were excited to build a bakery that provides a comfortable space for everyone. At Wooden Table Baking, most of the staff is made up of immigrant women, who Ozzuna says she identifies with. "I know what it's like to start from zero," she said. After all, when she came to the Bay Area, she didn't necessarily plan on staying; she just knew she wanted to live where she could openly love whomever she wanted. She owns the cafe with her wife, Citabria Ozzuna. Traditional and unconventional Italian pastries.